BY REPORTING STARVING, UNCARED FOR, INJURED, SICK, NEGLECTED OR ABUSED ANIMALS TO YOUR LOCAL ANIMAL CONTROL OFFICERS AND/OR SPCA. YOU CAN REMAIN ANONYMOUS, YOUR NAME IS KEPT PRIVATE. THE ANIMALS WILL CONTINUE TO SUFFER UNLESS SOMEONE LIKE YOU REPORTS THEM SO THE AUTHORITIES CAN STOP IT. All of us associated with this website are dedicated to teaching people about proper care of animals. Both the physical and mental well being of all creatures is everyone's responsibility. We need you to join us in fighting the good fight against animal abuse. All of us working together, one voice to help those creatures whom cannot speak out and help themselves. Taking even one tiny step towards stopping animal abuse is a large step for all mankind. Their suffering will continue if people like you and I do not step in and help them. They cannot help themselves, they need us. If you don't help the animals when you personally see Neglect and Abuse, who will? Be their voice! Just some of my Rescues are shown below on this page. 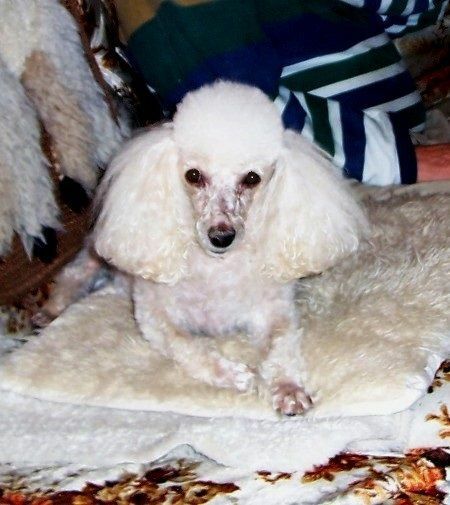 The story you are about to read involves a little Toy Poodle, named Ralphy and a wonderful gentleman, George S. of Edmonton, Alberta who was to become Ralphy’s owner and give Ralphy the loving home he deserved as all dogs do. From a life of suffering to a life of total happiness. 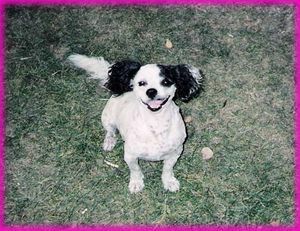 I had received correspondence stating that a dog breeder was going to shoot an unwanted male Toy Poodle. 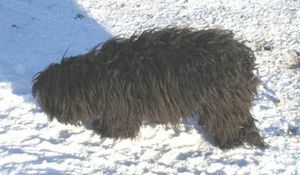 She was no longer going to breed Toy Poodles and the easiest way to dispose of unwanted dogs was simply to shoot them. I immediately phoned her. No problem, I could have him but I would have to “Buy Him”. I let her know that I was told she was going to shoot him so why not just give him to me? Her reply, “I don’t give nothing away. You want to save his life, you pay for him”. Ralph did not have a name when I purchased him. He was badly Neglected if no actual signs of Physically Abuse. By Neglect I mean he had food and water BUT: had never been given a name, touched, groomed, his toenails were grown in circles and some had pierced his pads of his feet, his coat was matted and filthy, he could not see as the face hair had grown over his eyes with open sores evident under his eyes. He had spent his entire life in a 4 foot X 4 foot pen so was quite mentally unstable when first viewed by me. Perhaps the lady who owned these poor dogs was not a cruel person "Intentionally". Key word here is "Intentionally"!!! Regardless she was still a "Puppy Mill" who failed to give "An Acceptable Level Of Care" to her animals but at least she fed and watered them and provided some shelter. 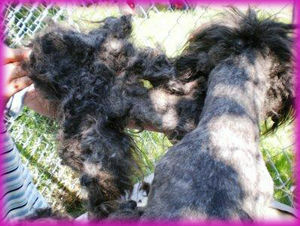 Many Puppy Mills do not even do that decently. Puppy Mills keep the poor dogs LOCKED UP (in often tiny, filthy pens) with no Freedom or Love. To a Puppy Mill, they are not living, breathing animals, just "Money Making Machines". And many of them are destroyed by gunshot or other even crueler means when no longer wanted as Ralph had faced. I expected it to take months (if at all) for Ralph to respond to Human Kindness. But he was so Intelligent and of such a Sweet Nature that the first day when I got him home, he stood patiently to be shaved, have his nails taken care of, vaccinated, dewormed, Fleas treated, open sores and painful hot spots on his little body treated, etc. All this without ever having been handled before. Ralph's greatest problem was learning about FREEDOM. At 3.5 years old he simply did not know how to run and play. He had to learn to run in a straight line instead of "Spin In Circles" which is all he could ever do for exercise in a 4 X 4 foot pen. Amazingly, he house trained himself almost immediately which again showed his great Intelligence as many Puppy Mill dogs can be very hard to housetrain. Simply because they have had to urinate, defecate, then live and sleep in their own excrement all their lives. Ralphy was a joy to have here on my acreage. But soon he was ready for a new, forever home. His new home, handpicked by me from many applicants was the perfect choice. If you believe in Destiny as I do, then you understand me when I say, “It was Destiny that George and Ralphy be together forever”. The two of them loved each other more deeply than can ever be put into written words. Ralphy has now passed on from this world. But never from George’s heart where he remains forever. Thank You George for making little Ralphy’s life one of such happiness. Click to Read "Mia Mia's Rescue Story"
Click to read "Pepsi's Sad Story"
Click to read "Trying To Save Bingo"
GHOST and TARA: Tara gave Ghost the safety and security she desperately craved. It was a bitterly cold winter day. My animals at home were content and I was taking a few precious hours off from their care to go to a pre-Christmas party. Driving along, at first, I thought the lump of black right in the middle of the road was a chunk of mud that had fallen off the under carriage of some ones vehicle. It was a half grown kitten. The tracks on the side of the road in the snow showed someone had stopped and thrown it from their vehicle. Then accelerated away from the spin marks left by the vehicles back tires. Another animal dumped by uncaring, disgusting humans on a back country road to die an agonizing death. How I detest such people. 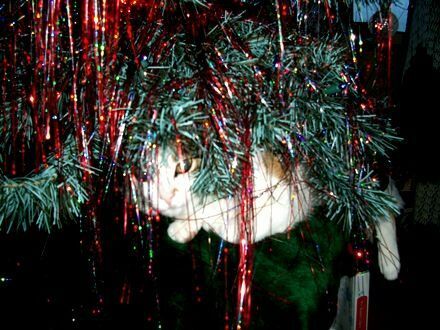 Christmas party forgotten, I attempted to approach the kitten quietly. It had lain there long enough in one spot that it was partially frozen to the hard packed snow on the road, leaving some hair stuck to the ice as it leapt to its feet and disappeared under my car. It crawled up into the motor under my hood. I quickly shut the car off before it came into contact with the deadly motor fan. Extracting the frightened kitten from my car motor took a long time and I was plenty cold by the time it was safely inside my car. With my pack of dogs, the kitten needed a home other than mine. Pandora and Leonard, experienced cat people stepped foreward to assist, taking it into their home. The kitten was a bag of bones, it was so thin. Wild and scared to death. We found a partially healed old scar on its neck and lumps from other old injuries. It was not until part of the tail fell off, did we discovered it had a tight, elastic band, cruelly cutting into the tail. She simply disappeared into hiding places in our home. We knew she was eating and drinking but only caught glimpses of her out of the corner of our eyes. We named her “Ghost”. The only one creature she would come out of hiding for was our German Shepard cross dog, Tara. Ghost followed Tara everywhere. She clung to Tara with silent desperation. This was not simply “Cat likes Dog”. 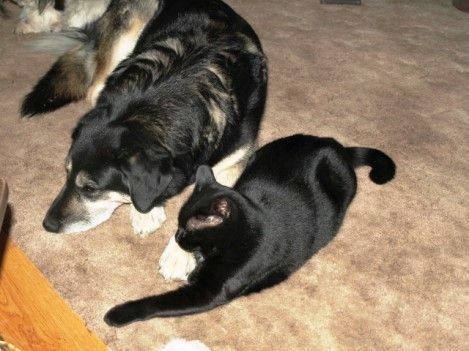 Not simply “Cat gets along with Dog”. This was a cat desperately seeking a dog to protect it. It was obvious that she had lived with a large dog before. Perhaps a dog who had fed and protected her. More than likely the only trustworthy thing in her life had been a dog. We will always wonder what kind of life that dog was forced to live. If Ghost was that thin and had suffered at the hands of mankind, was the dog also suffering? Was it dumped on some country road too? Was it starving too? Did it bear scars like Ghost’s? We literally had to trap Ghost in our own home to transport her to the Veterinarian for vaccinations, deworming and getting spayed. It has taken years for Ghost to not always flee when approached. She now occasionally accepts us to gently stroke her soft fur for only a minute or two. She is so beautiful. Whoever you are, the person who dumped a starving, abused kitten on that snowy road in the cold of winter, may you be forgiven for your cruelty. And the first dog in Ghost’s life? We never met you but we will always think of you and pray you found a loving home too. My Hero's: Gordon Southward, his beautiful wife Shelly and their son Caige from Cold Lake, Alberta are my hero's. I have known this fine family for a number of years as Gordon is my "Christian Adviser" working with me to become a better Christian. In May/2015 a father and mother Fox made the mistake of raiding someones chicken coop. The result is they were shot dead. Shortly after, 4 tiny Fox Kits, far to young to survive without their Mom left their den in desperate search of nourishment. Starving and weak they cried for their Mom to come feed them. Gordon and his family came to their Rescue. Following them back to their deep den, they set out to save them. For hours they dug in the hot sun as Fox dens are notoriously deep, then finally they were able to rescue them to save their lives. They did not stop there though. 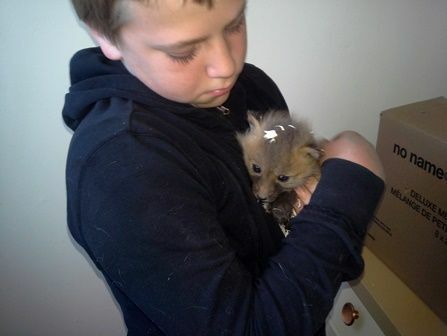 They contacted a Wildlife Expert on feeding and care of Fox Kits who works to rehabilitate "Gods Creatures Of The Wild", then when old enough to survive on their own, releases them back into the wild. They made the long drive to this persons place and the saving of these 4 Kits was complete. Thank You Gordon, Shelley and Caige for your kindness for all Gods Creatures. Gayle, owner of this website. SAMARA: Samara relaxing under the Christmas Tree in 2015. Samara is a kitty I Rescued after being thrown in a ditch and left to die. Her loving owners, Bob and Ann A. of Bonnyville helped pay for her recovery (including surgery for her broken bones). Blessed are the Animals in God�s Hands with people like Bob and Ann. Bob and Ann first took a Rescued Dog from me 15 years ago. Then they took in tiny Samara too. Bob and Ann are CHAMPIONS is all I can say.